Would you like to contribute to JWWM episode posts?? (by helping to transcribe dialogue of Season 4 episodes?) | "Just walk with me.."
Hi Everyone! I’m trying to make sure that, no matter how busy life gets this year – the walk will be able to continue so I need to plan ahead a little for walking through season 4. Firstly though – A huge thank you to everyone who hel ped out with transcribing the dialogue for season 3 episodes – you have been a massive help. Thanks to Kiwismh, Learjet, KC, Debilyn, Cindy, Jestress, Lauren, Morley, BJo, Jule, Happycamper, Karyn, Bitsy Beans and Melissa R – we Salute You!! It is no exaggeration for me to say that without you I’d probably still be back at the start of season 3 or something lol!! Now that I am trying to get ahead before real life picks up the pace for 2016, I thought it would be a good time to put out there my request for assistance with transcribing the dialogue of season 4 episodes. There is no obligation – but if transcribing is your kind of thing: It would be wonderful if you could help JWWM continue to chug along by supplying an episode’s dialogue. No need to provide detail of the actions in a scene if you don’t wish to (but feel free to do this if you like – Operation Sandstorm may be able to benefit..), really I’m just after the actual dialogue so I can get the posts together more quickly. 3. Unfinished Business -Learjet has volunteered [Now hosted on smk-land.com for Operation Sandstorm.] -Received! Thank you!!!! 5. It’s in the Water -Received! Thank you Cindy!!!! 6. Night Crawler -Jaemie has transcribed this whole episode for Operation Sandstorm and it’s available at smk-land.com Thanks Jaemie! 7. Billy’s Lost Weekend -Received! Thank you Kiwismh! 8. Photo Finish -[Now hosted on smk-land.com for Operation Sandstorm.] -Received! Thank you Ruth!!!! Thanks Learjet for helping! 9. The Man Who Died Twice -Clagjanet has finished transcribing- Received! Thank you Clagjanet!! 10. Need to Know – -[Now hosted on smk-land.com for Operation Sandstorm.] -Received! Thank you Sara!!!! Thanks Learjet for helping! 11. Santa’s Got a Brand New Bag – Clagjanet has volunteered – pending submission. 12. Any Number Can Play –Learjet has transcribed this whole episode for Operation Sandstorm and it’s available at smk-land.com Thanks Learjet! 13. Promises to Keep – happy camper has volunteered – pending submission. 14. Rumors of My Death -Kiwismh has volunteered – pending submission. 15. Bad Timing – Sara has volunteered – pending submission. 16. Do You Take This Spy – KC has volunteered – pending submission. 17. Mission of Gold – Melissa R has volunteered – pending submission. 18. One Flew East – BJo has volunteered – pending submission. 20. Suitable for Framing – Melissa R has volunteered – pending submission. 21. A Matter of Choice -Lauren has volunteered – pending submission. 22. The Khrushchev List -Learjet has volunteered – pending submission. If you can help out please comment here or email me if you like. Bring on Season 4!!!! I can’t wait to walk through it with you all!!! This entry was posted in Season Four, SMK Transcriptions and tagged Scarecrow and Mrs King. Bookmark the permalink. Hi Everyone! hope you are well!!! I’ve just updated this blog post to reflect submissions of transcripts to either me or smk-land.com for operation sandstorm. thanks to everyone for helping out!! I’ve just finished writing blog posts for No Thanks for the Memory and am about to start working on It’s in the Water. Thanks so much for sending this transcript to me Cindy! If I’m guessing I write an episode a month (being fastest pace possible I think), then I’m guessing I’ll be up to working on nightcrawler in Feb 2018, Billy’s lost weekend March 2018, Photo Finish April 2018, and The man who died twice May 2018. I have all the transcriptions up to may – Hollywoodi how are you going work on the man who died twice? Do you think completing transcribing the dialogue for this episode by May 2018 is possible? if not – no problem at all, just email me if you like – or comment here and throw the episode back in the mix – or maybe someone else can do part of the episode and help you out? SMK is for fun all – so no pressure here and please feel free to say if your situation changes and another member of our community will help out. I don’t think I’ll worry about episodes beyond May 2018 for now..
Hope you are all well and bye for now! Iwsod, if you don’t hear back from Hollywoodi, I can take on “Man Who Died Twice” I think. Just let me know. I was having an issue logging in, which caused me to not be able to comment. I got it all sorted out now, so I hope to be back in business! I’m on it! Iwsod, adjust your notes accordingly! thanks for getting in touch and sorry to hear wordpress has been giving you issues! So glad to hear it’s sorted now and that we can hear from you more often – when you can! Pingback: A Big Shout out to Transcribers on JWWM!! | "Just walk with me.."
An smk fan who stops by (they can identify themselves if they choose, I’ll leave that to them) has asked if these transcripts contribute to Petra’s site. The short answer is – they don’t directly! But.. the long answer is – they can contribute!! How? If an episode you are transcribing dialogue for JWWM for isn’t allocated to someone to be transcribed for Operation Sandstorm, then there is no reason why you could not contact Lovely Petra at smk-land.com and put your name forward as the person to do it for Operation Sandstorm! And you could contribute the whole transcript for Operation Sandstorm. Go for it! The transcripts for JWWM are dialogue only.. The transcripts for smk-land and operation sandstorm are settings, actions, dialogue and everything. Which could be really useful for the person who is transcribing an episode for operation sandstorm and reduce their workload.. Previously, I’ve posted on the Yuku forum thread for Operation Sandstorm (this is where it all started!) to say that any fans who are transcribing for Operation sandstorm are welcome to come by JWWM, and copy the dialogue from the posts.. or they can email me and I can send the dialogue transcript- I hope this is okay with everyone. If I do get a request (I think I’ve gotten maybe one?!) I’ve shared the transcribed dialogue and asked that the person who transcribed the dialogue for JWWM get shared credit for the Operation Sandstorm transcript. I think fair’s fair.. Sharing is great and good – but it’s also good to acknowledge the work of others. If you are not okay with this guys please let me know.. otherwise I’ll assume you are okay with it. I need to get over to Yuku and repeat this offer.. but haven’t had the time to get over there and remember my password. oh boy.. I suspect the transcripts for Operation Sandstorm are moving along slowly. very slowly.. you know how real life is.. and there is no deadline for operation sandstorm it could take years – lol whereas here we know I’ll be needing it eventually to walk through the episode.. Okay gotta run – I hope this clarifies things. I’ve already been in contact with the lovely Petra, and she said she would love the scripts we can contribute. And no rush, she is updating her site and wouldn’t be able to upload them for awhile anyway. Oh thanks for the update Cindy! I just emailed the lovely Petra.. it’s been ages since we were in touch.. that explains why some of her links are not working. Just an update Iwsod that I have a first draft done of “Thanks for the Memory” and will be trying to do a quality check and final format this week for you. You’ll be pleased to hear they sat “pot pourri” TWICE in this one! Wow!! Thanks Janet! How did you find doing it? lol- Pot pourri?! haaaa oh noo don’t tell me! haa haaaaa! I think it is extra hard not to jump ahead when you are actually transcribing an episode.. you’re immersed in it and things come up that you want to say and share! I’m so in the groove now of writing for the walk that I really struggle to do straight transcriptions! Just an idea I thought I’d share if anyone else wanted to try it. 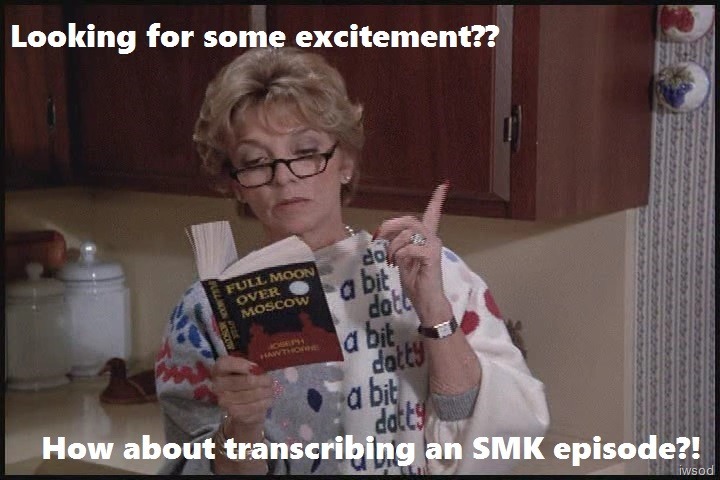 If it makes transcribing more fun go for it. lol! Wouldn’t it be fun if after this walk we started a new walk – which had multiple authors?? It would certainly make it more feasible to do another walk through (I’m committed to finishing the walk but being so busy in RL now means it’s going to take longer than I would have liked) hmm.. an idea to ponder! Can you imagine if we had 88 different authors?! that would be a real celebration of smk and the talents and diversity of it’s fans!! Hmmm.. what would it be called? Is this concept interesting to anyone else? or just me.. haaaaa..
Great, idea of Cindy’s! I’ll have to use that tip for One Flew East. Ohhhh I’m sure a BJo commentary would be hilarious!!! 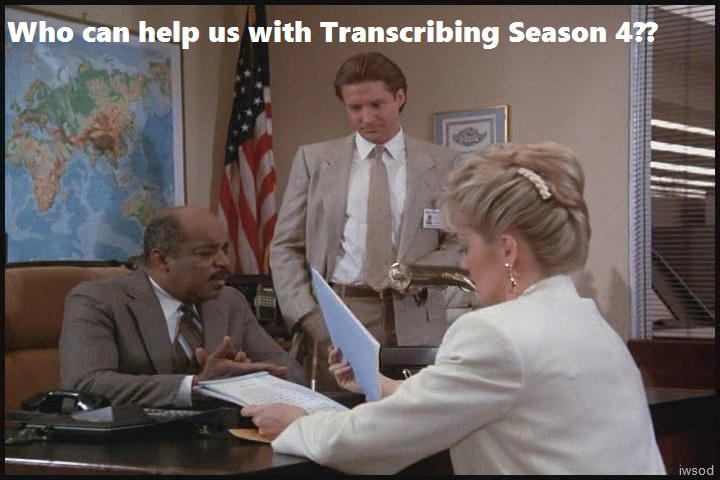 Have you done any transcribing? How do you find doing it? How many pages are most episodes? Just wondering. I like Cindy’s idea too. I think it makes sense to use different style text to keep things easy for you to find and copy, but I hadn’t thought of different colors. I assume that’s a lot of text so the easier the better. Oh phew. I finally remembered to get back here – sorry Sara for the delay. I think the number of pages varies depending on the episode. some have more dialogue than others.. but.. lol – different people use different sized fonts .. spacings etc.. haaaa.. and some include more than just description because they feel like it – which is fine… it’s all great! -Happy camper’s transcript of the Pharaoh’s engineer was 16 pages in font 12..
As for what I prefer? really – it’s what Learjet would prefer! Learjet is very kind and takes the transcripts, puts them into the file type we use to write the blog posts and she formats the dialogue so it is ready for me to go ahead and write the blog posts – she does this so the blog posts take me less time to put together.. and they are a huge help! Hi all. When I transcribe for Operation Sandstorm, it’s usually just under 30 pages including all descriptions. KC does longer ones, but she’s the Queen of Detail 🙂 I notice other people have shorter ones, even including descriptions. I think with no descriptive passages, an episode probably comes in around 16 to 18 pages. Colours won’t show up in the Blog writing software that Iwsod uses – just bold, underlining and italics. Yes, I too appreciate all additional instruction. I have done some preliminary prep on “Photo Finish” but will have to wait a few more weeks to get serious as RL is intense at the moment. I can do “Mission of Gold” and Suitable for Framing” if still needed. Or I can do any two that is still needed, just let me know which ones! I’m thinking I should add some swoon reviver to this post.. even I remember there are some mighty massive swoons ahead for you transcribers -and you have to actually listen and type? phew..
That’s why I chose “It’s in the Water” I don’t remember much about the episode, but I figure there is not as many romantic moments when dealing with green, slimy water and treatment plants. But I could be wrong. I was going to go for that one and then I remembered how impossible it is to concentrate when he never takes his eyes off her once during the ceremony and I knew I’d spend too much time in a puddle on the floor. A friendly reminder to everyone (not specifically to Hollywoodi) please avoid discussing specifics of future episodes on JWWM.. and if you would like to have this discussion you can go for it over at Nedlindgers and swoon and anticipate freely 🙂 thanks guys! To add further – there is a thread on transcribing for JWWM at Neds which might be a good place for people to share ideas on the transcription process, what works for them and how much detail to include. Hollywoodi how are you going work on the man who died twice? Do you think completing transcribing the dialogue for this episode by May 2018 is possible? I hope you are well -it’s been ages since we had the pleasure of seeing you around JWWM – bye! Yeah, but if you do KC, no one will judge you 😉 Haha! PS – “Dead Men Leave No Trails” is one of my favorites!! Thanks for writing the transcript of that one KC! Thanks Hollywoodi!!! – I’ll put you down for the man who died twice. Ok, great. And you’re welcome! I will take an episode — no preference, as nearly all of these are unfamiliar to me. Sorry this took so long to get back — I thought I had answered it already. You can put me down for Promises to Keep. Hiya, iwsod! One Flew East is a favorite of mine, so I’ll be happy to help with that. I’m not sure I can do the whole thing, but I will do as much as I can. If anyone out there wants to help, that would be great. Thanks sooo much to everyone who has volunteered so far! Lee: Give this to the man in the red hat! maybe you can just label a new scene so it’s easy for me to follow e.g. IFF, Amanda’s House, Garage. That’s really it! If you are interested in doing all the actions etc. for Operation Sandstorm then follow the link to the Operation Sandstorm page to find out more. It would be easiest if you visited Petra’s smk website where all the full transcripts (which include all actions) are listed- you can see for yourself how others have done it. When does the transcribing need to be finished by? I’m not sure exactly. But as a guide I would say that I would be up to writing stemwinder by about July 2016 at the earliest. I’ve gotten this post up so anyone who is interested would not feel rushed. I’d guess maybe a month to write posts for a full episode.. So if I would start writing stemwinder’s JWWM posts about July (it could be later this is just a guide), then ‘It’s in the water’ I would get to November 2016 at the earliest. When I’ve started writing an episode a few episodes ahead of one where a transcript is yet to be finished, I will stop by here and check on how things are going and see if someone needs a hand finishing up.. so a few months before I need the episode I would let you know how things are looking.. It could be that I am writing episodes much more slowly.. this is all me just guessing but I hope this helps! Okay, it looks like “Photo Finish” is the first unclaimed S4 episode, so I will take it. Hopefully if it goes well, I will do more. Thank you Ruth!! Photo Finish would be great! that’s a good idea.. try it out and see if you like it..
That’s a good idea! It will be ages before I get to them.. plenty of time to forget what you know 😉 Thanks Cindy! If no one wants Bad Timing, I’ll cover that one. I’m working on a couple side tasks involving the Stemwinders and Bad Timing, so the transcripts will help. Hello Sara, thanks so much for offering to transcribe Bad Timing! I just found out that KC is transcribing both Stemwinders for Operation Sandstorm – and she is progressing in that.. I didn’t know sorry! Sara if you can transcribe Bad Timing that would be awesome! I will update the post later today to say KC is transcribing the stems. I’m in the middle of work and need to get back to it – but really quickly wanted to update you Sara on Stemwinder. Bye- I’ll be back later! No problem. 🙂 I can cover Need to Know and Bad Timing. Will that work? I would like to try my hand at transcribing an episode, Iwsod. If you will compile your list of what has already been spoken for and let me know the next most urgent episode needed, I volunteer. I spent my career as an official court reporter, so I have a fair amount of transcription experience. Not so sure about providing action detail, as I have done very little script reading to know how it’s done, but dialog should be no problem. Also, like Janet, would like some guidance on formatting. Hello! Thanks for helping out with two episodes Kiwismh! I’m not sure if you saw my comment to you on the season 3 thread – have you sent me Wrong Number yet? It’s possible you have and I lost it when my computer died.. I now keep them on my dropbox! 😉 Thanks Kiwismh!!!! I have all the dialogue transcripts for season 3 now except Wrong Number 🙂 You guys are amazing!!! I can do the other stemwinder, which ever one Sara doesn’t do. Or that is.. I’d like to do both, but if you would prefer one Stemwinder over another episode, that’s fine. I can do “No Thanks for the Memory”, but you’ll have to give us some hints on how you need to get them. I’ve only got good old fashioned Word for getting stuff down! Thank you Lauren!! So great to see you stop by 🙂 I hope you are well!! Your choice is a Matter of choice? haaaa.. I bet I could do a scene or two here and there. Not sure what real life is going to look like later this year but right now it is pretty overwhelming (does “overwhelming” ever stop?). I’m transcribing “Unfinished Business” for Operation Sandstorm so I’ll pass that on to you, Iwsod. I’m also prepared to take on “The Khrushchev list” unless someone else wants it? ?